"Electronic Invoicing: Top 5 Ways to Get Paid Faster in 2017"
Electronic invoicing delivers efficiencies across the accounts receivable cycle: invoice creation, invoice delivery, dispute management, posting, and reporting and analytics. Most impor­tantly, reducing Days Sales Outstanding (DSO) with electronic invoicing enables businesses to reinvest more quickly to drive company growth. 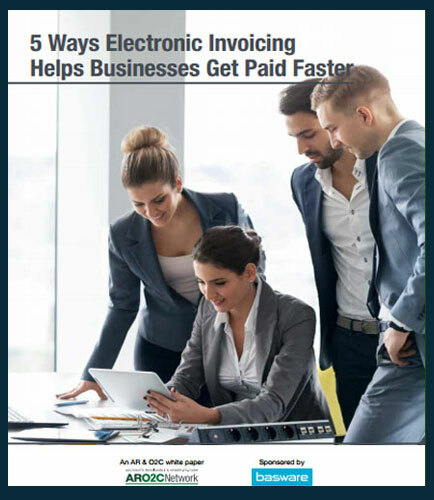 This white paper details the inefficiencies of pa­per-based billing processes, and shows five ways that electronic invoicing accelerates the accounts receiv­able cycle, and, in turn, greatly reduces DSO. Invoice preparation: With electronic invoicing, businesses can virtually eliminate the time required to prepare invoices. Invoice presentment: Sending paper invoices internationally can add days or weeks to the invoice delivery process. An invoice is an official statement of payments issued by the seller to the buyer describing the number of items sold, rate of each item, date and time of shipment, and the total price payable by the purchaser. An invoice is also referred to as ‘bill of sale’ or ‘contract of sale.An invoice, therefore, serves as a vital document carrying all the detailed information of the products or services offered by the vendor.